We've recently reduced the sale price down an additional 25% off. Buy now and save. Zimecterin Gold is the first and only de-wormer approved by the FDA to eliminate 61 species and stages of equine parasites. Combines Ivermectin and Praziquantel to offer the most comprehensive equine parasite control. Offers a spectrum of control so complete it even protects against tapeworms. ZIMECTERIN® GOLD (ivermectin/praziquantel) Paste provides effective treatment and control of the following parasites in horses. Summer Sores - caused by Habronema and Draschia spp. cutaneous third-stage larvae; Dermatitis caused by neck threadworm microfilariae, Onchocerca sp. This syringe contains sufficient paste to treat one 1250 lb horse at the recommended dose rate of 91 mcg ivermectin per lb (200 mcg/kg) body weight and 454 mcg praziquantel per lb (1 mg/kg) body weight. Each weight marking on the syringe plunger delivers enough paste to treat 250 lb body weight. 1. While holding plunger, turn the knurled ring on the plunger 1/4 turn to the left and slide it so the side nearest the barrel is at the prescribed weight marking. 2. Lock the ring in place by making a 1/4 turn to the right. 3. Make sure that the horse's mouth contains no feed. 4. Remove the cover from the tip of the syringe. 5. Insert the syringe tip into the horse's mouth at the space between the teeth. 6. Depress the plunger as far as it will go, depositing paste on the back of the tongue. 7. Immediately raise the horse's head for a few seconds after dosing. All horses should be included in a regular parasite control program with particular attention being paid to mares, foals and yearlings. Foals should be treated initially at 2 months of age, and routine treatment repeated as appropriate. Consult your veterinarian for a control program to meet your specific needs. ZIMECTERIN® GOLD Paste effectively controls gastrointestinal cestodes, nematodes and bots of horses. Regular treatment will reduce the chances of verminous arteritis caused by Strongylus vulgaris. ZIMECTERIN® GOLD Paste kills important internal parasites, including tapeworms, bots and the arterial stages of S. vulgaris, with a single dose. ZIMECTERIN® GOLD Paste is a potent antiparasitic agent that is neither a benzimidazole nor an organophosphate. ZIMECTERIN® GOLD Paste may be used in horses two months of age or older. ZIMECTERIN® GOLD Paste has not been tested in foals younger than two months of age, mares at or near the time of breeding, pregnant or lactating mares, and breeding stallions. 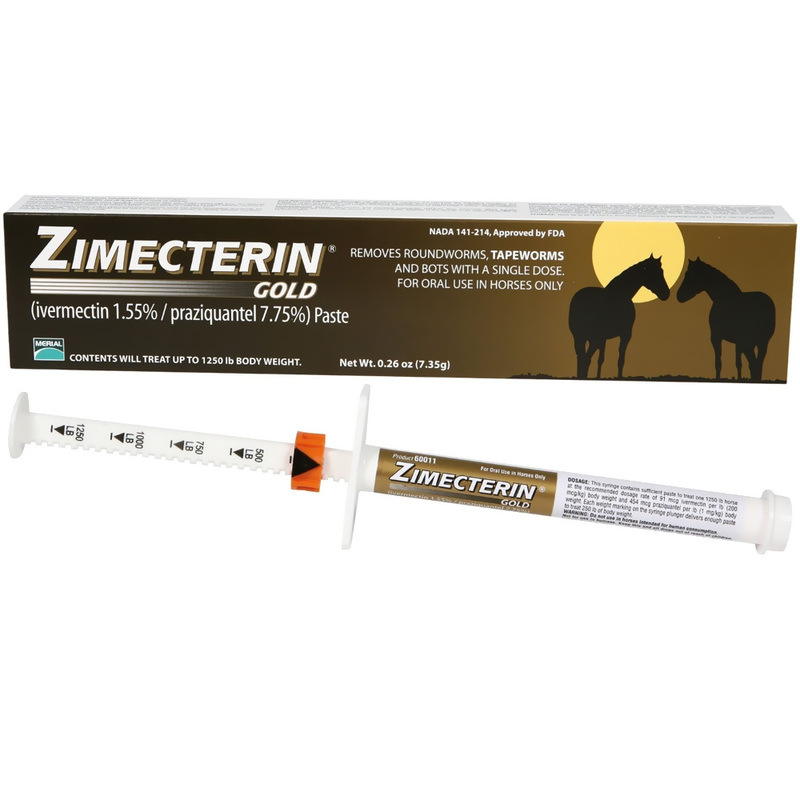 ZIMECTERIN® GOLD Paste, when tested at 1, 3 and 5-times the maximum recommended dose every two weeks in 5-month old foals, and at 10-times the maximum recommended dose in a separate study, did not elicit any adverse clinical signs of toxicity. In a foal safety study in younger animals, ZIMECTERIN® GOLD Paste was found safe at up to 3-times the maximum recommended dose in 2-month old foals. Not for use in humans. Keep this and all drugs out of the reach of children. Refrain from eating or smoking when handling. Wash hands after use. Avoid contact with eyes. The Material Safety Data Sheet (MSDS) contains more detailed occupational safety information. To report adverse reactions in users, to obtain more information, or to obtain a MSDS, contact Merial at 1-888-637-4251. ZIMECTERIN® GOLD (ivermectin/praziquantel) Paste has been formulated specifically for use in horses only. This product should not be used in other animal species as severe adverse reactions, including fatalities in dogs, may result. Although not all adverse reactions are reported, the following reactions are based on voluntary post-approval drug experience reporting. There have been rare reports of swelling and irritation of the mouth, lips, and tongue following administration of ZIMECTERIN® GOLD. These reactions have been transitory in nature. Swelling and itching reactions after treatment with ivermectin have occurred in horses carrying heavy infections of neck threadworm (Onchocerca sp.) microfilariae. These reactions were most likely the result of microfilariae dying in large numbers. Symptomatic treatment may be advisable. Consult your veterinarian should any such reactions occur. Healing of summer sores involving extensive tissue changes may require other appropriate therapy in conjunction with treatment with ZIMECTERIN® GOLD Paste. Reinfection, and measures for its prevention, should also be considered. Consult your veterinarian if the condition does not improve. Store up to 86°F (30°C). Transient exposure to temperatures up to 104°F (40°C) is permitted. AND BOTS WITH A SINGLE DOSE. CONTENTS WILL TREAT UP TO 1250 lb BODY WEIGHT.